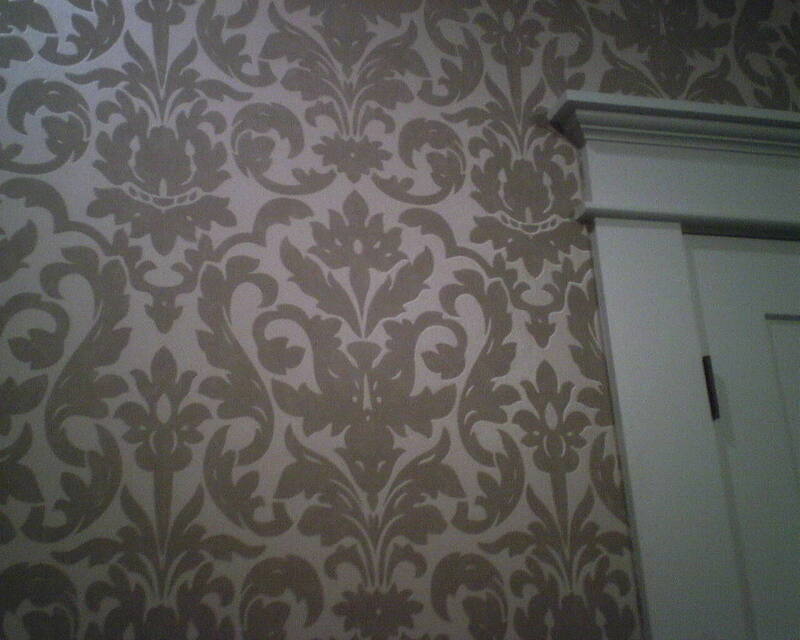 Here is an example of a current trend in wallpaper designs – a traditional motif like this damask, but blown up to be very large, and in unexpected colors. This taupe-on-taupe goes amazingly well with the builder’s choice of color on the woodwork. A damask is a traditional design, but in this over scale size, it has a bit of sass, and works nicely with the room’s “modern rustic industrial” features, like the rolling wooden barn door. The room was meant to be a home office, but this young family is using it for “Grandma’s room.” Grandma visits weekly, and the homeowner wanted her room to be inviting and spa-like. 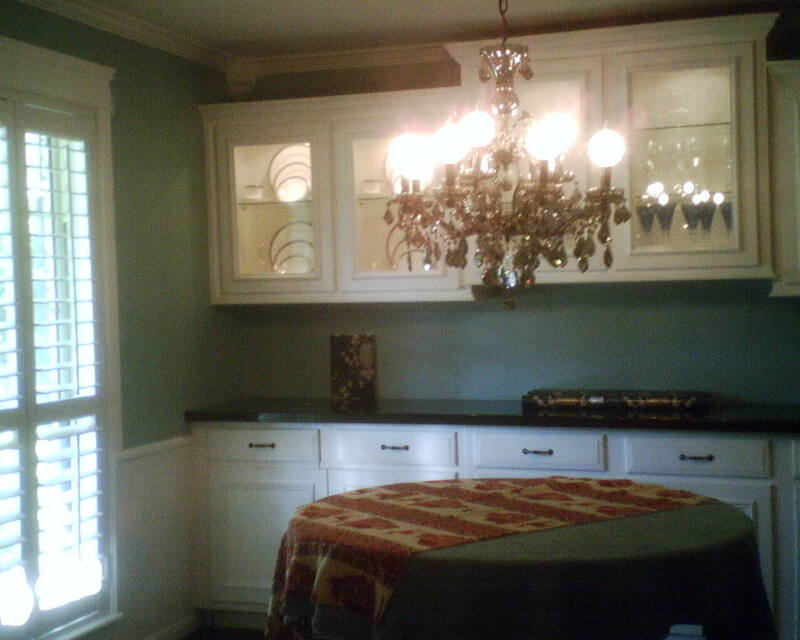 Accent colors will be a murky turquoise, with bits of lighter turquoise, which are superb spa colors. 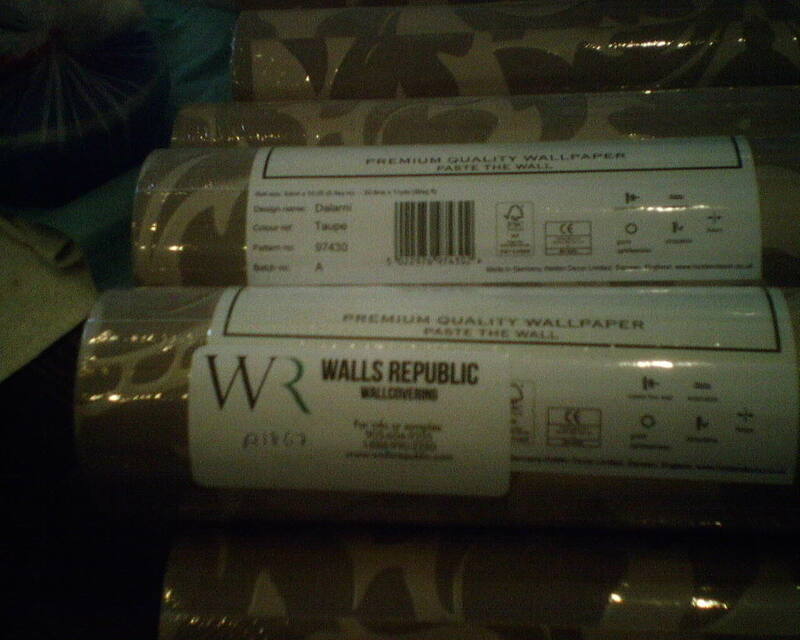 The paper was bought from Walls Republic, and is a non-woven material and was installed with the paste-the-wall method. The house is in the far eastern edge of the Houston Heights. 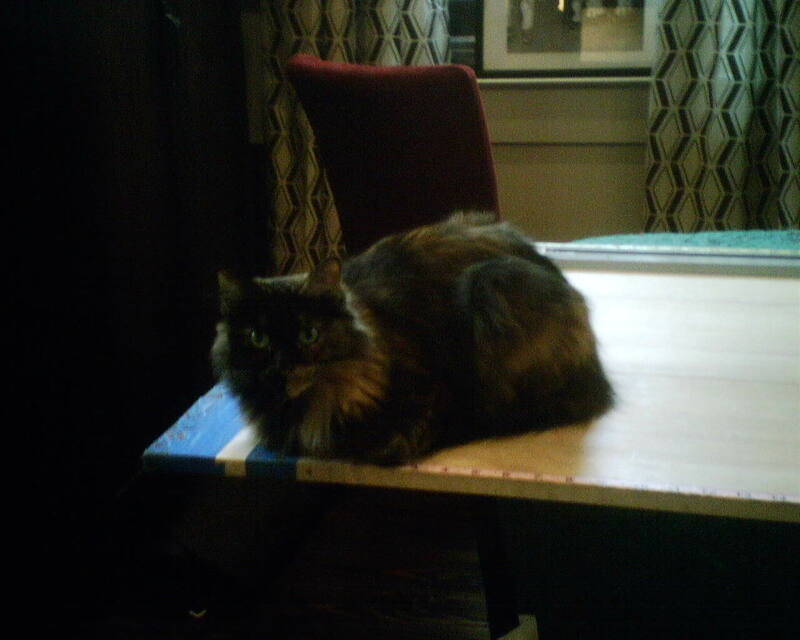 I turn around to hang a strip of wallpaper, and look who pops up on my work table! O.K. – maybe Van Gogh didn’t sleep here, in this brand new home on the eastern edge of the Houston Heights, but it does look like he spent some time painting on the walls. 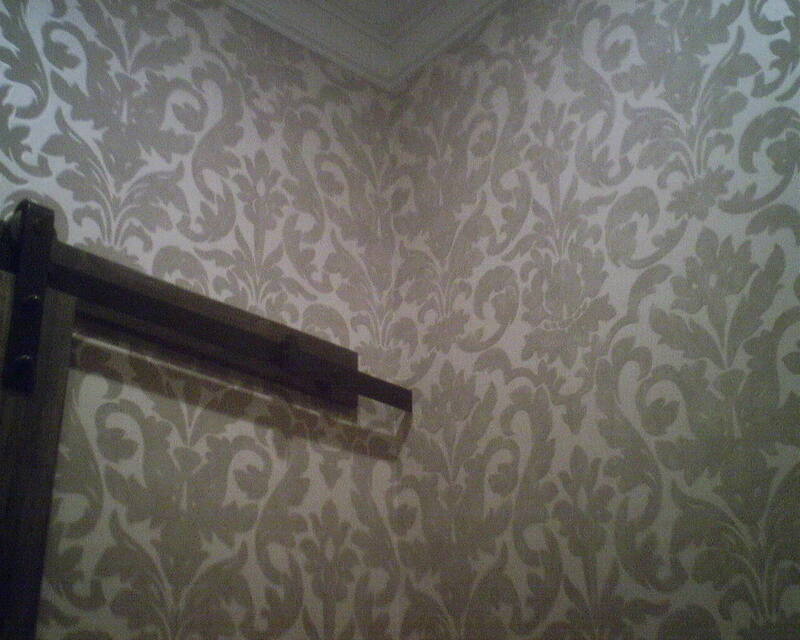 Oh, wait – that’s wallpaper! 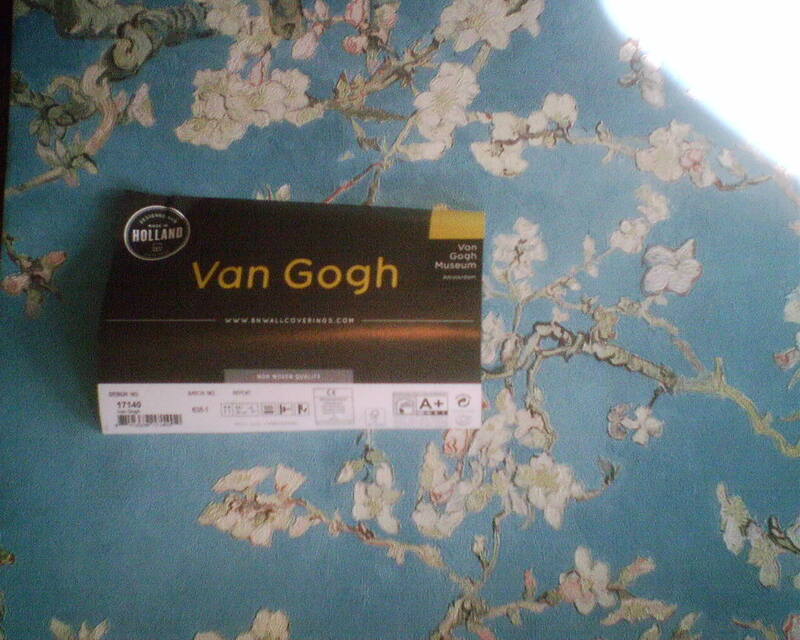 This beautiful wallpaper is in the Van Gogh 2015 collection of a company called BN Wallcoverings, in the Netherlands. It was a thinnish, pliable, textured, paste-the-wall material, and was nice to work with. 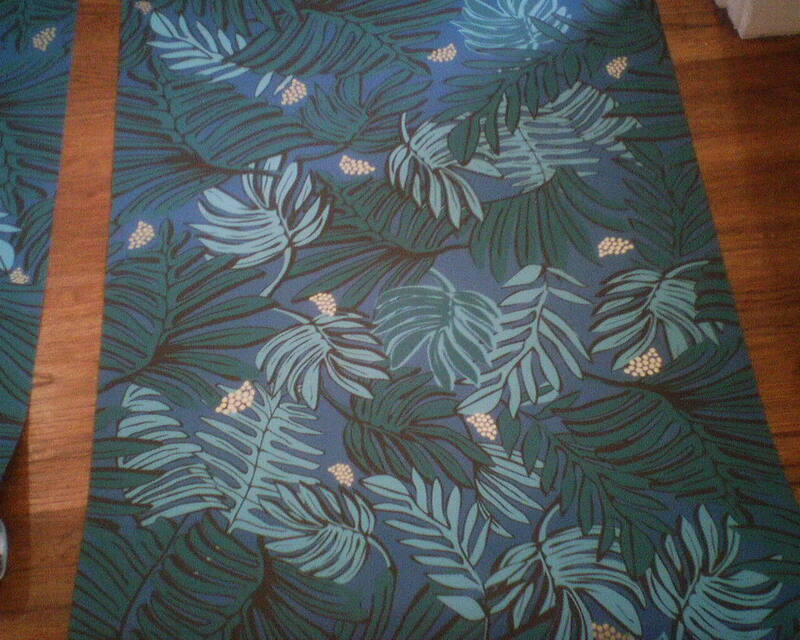 The homeowner is absolutely in love with this pattern! The builder left the home quite boringly neutral – creams and beiges – and the homeowner wanted to interject some life and color into the master bedroom. Wow – this did the trick! The texture of the material even mimics brush strokes an artist might make working with oil paint on canvas. This went on just one wall of the master bedroom, behind the headboard. On all four walls, this bold color and fluid pattern might be too much, but on one wall, it is super. For the windows and door leading to the balcony (not shown), drapes are being made that match the brown color of the tree limbs. Neutral-hued Roman shades will “disappear” on the small windows of this accent wall. A few turquoise accents throughout the room (pillows, vases, artwork) will pull the whole look together. 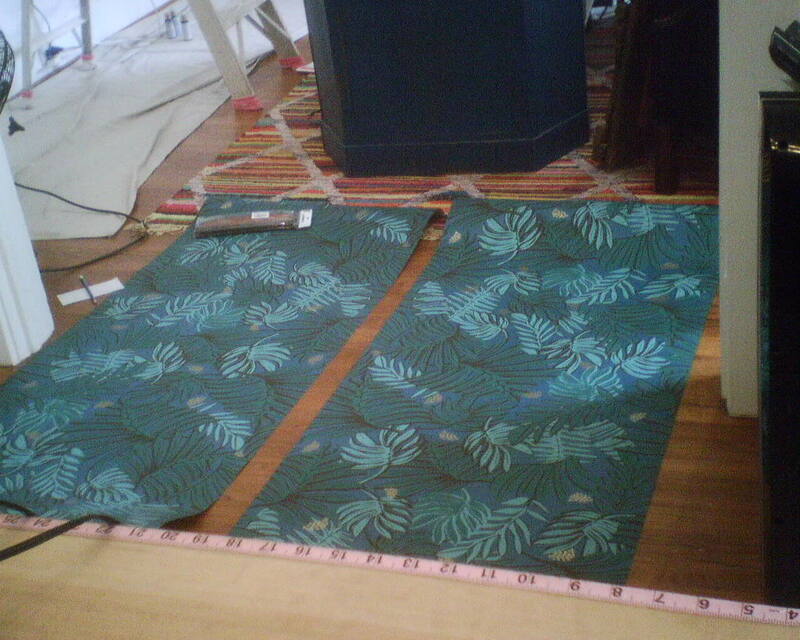 Here I am, laying two strips of wallpaper out side-by-side, to find the pattern match, and to see how the overall pattern plays out across the wall. I am also trying to determine which way is up! If you look closely at the second photo, notice the light blue leaf that is on the left, second from the top. Then look at the bottom, second light colored leaf from the right…. These two leaves are the same leaf, identical – but facing different directions. 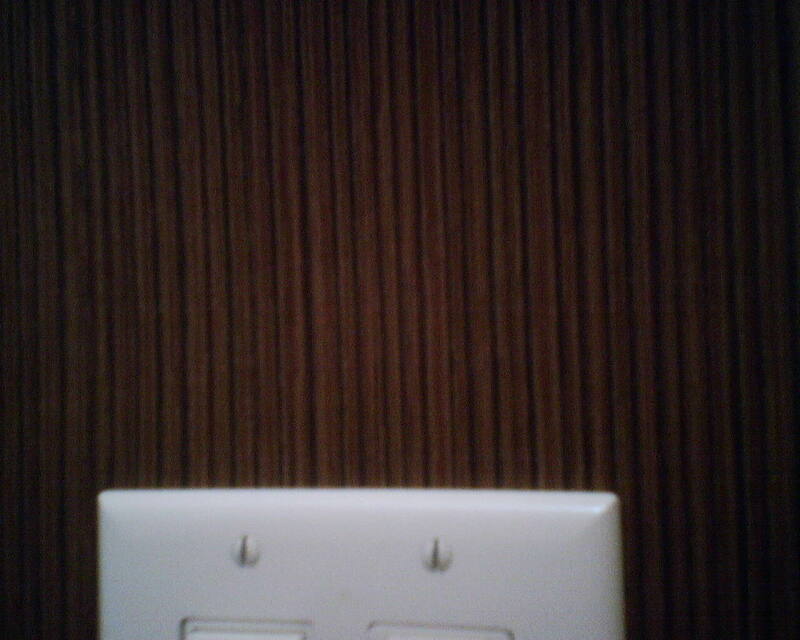 This is really a cleverly plotted wallpaper design. And, best for me, there is no truly correct “right side up,” so I could stop fretting and stewing and get down to hanging! This colorful and fun pattern is by Hygge & West, an on-line company. 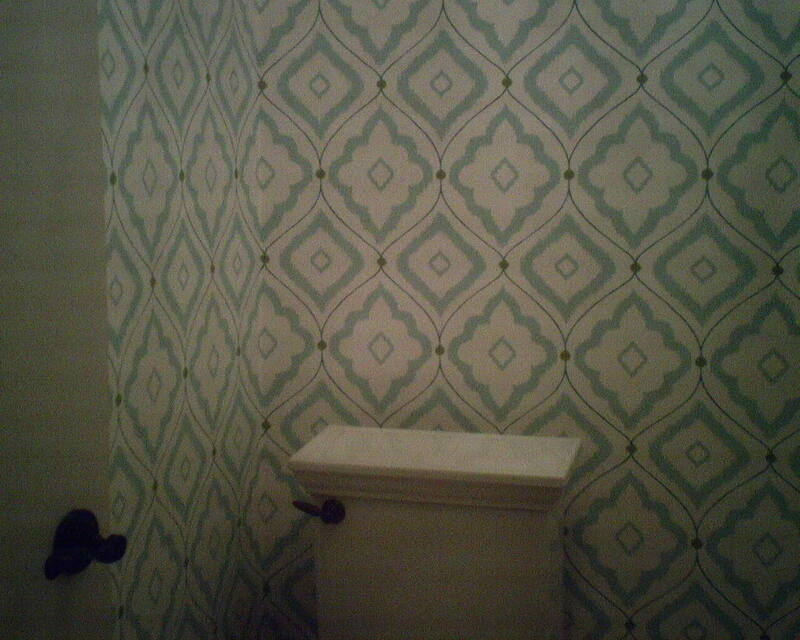 Today I repapered a powder room that I have done at least twice before, over 20 years or so. 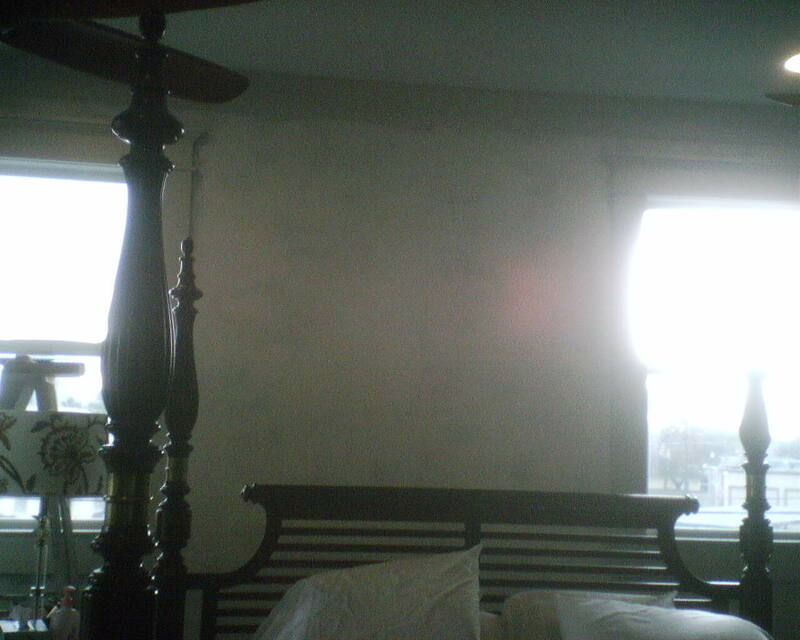 The existing paper stripped off easily, in part because it was a pre-pasted paper-backed solid-vinyl paper, and also because of the primer I used to seal the walls – oil-based KILZ Original. The primer protected the walls and kept them intact, and there was no damage to the walls whatsoever. 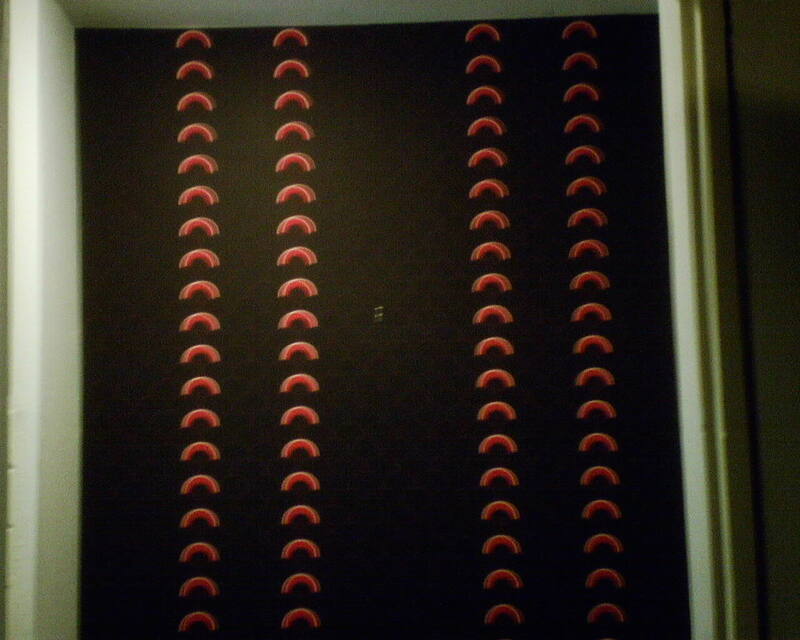 The photo shows all steps of removing this kind of wallpaper. The printed top vinyl / plastic layer is pulled off. With this kind of paper, the top layer usually separates and pulls off easily and in large pieces. This leaves a paper backing still stuck to the wall. This is the light tan area you see in the photo. I use a wet sponge to soak this layer. When it gets good and wet, it turns dark tan, as seen in the photo. The next step is to remove this backing. 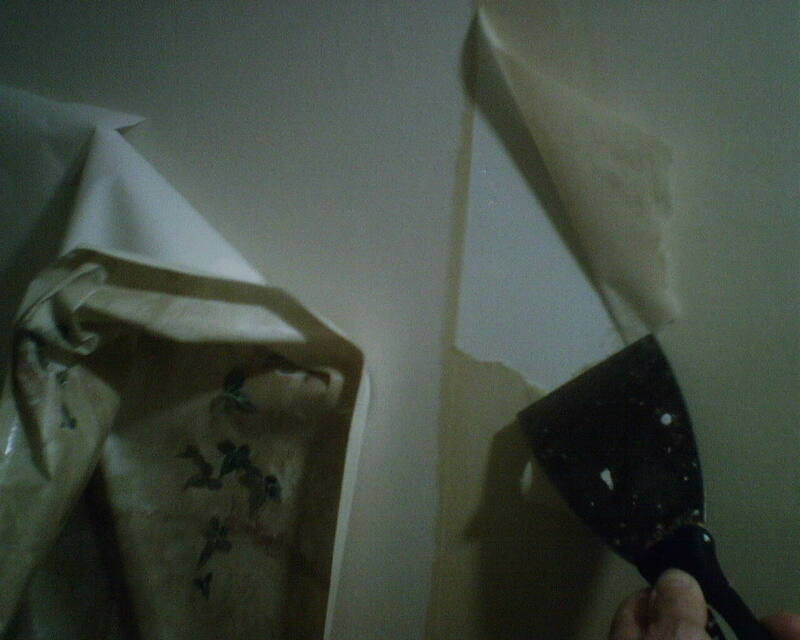 Once it’s good and wet, the paste holding it to the wall will reactivate, and the wallpaper will peel away from the wall easily and in large pieces. 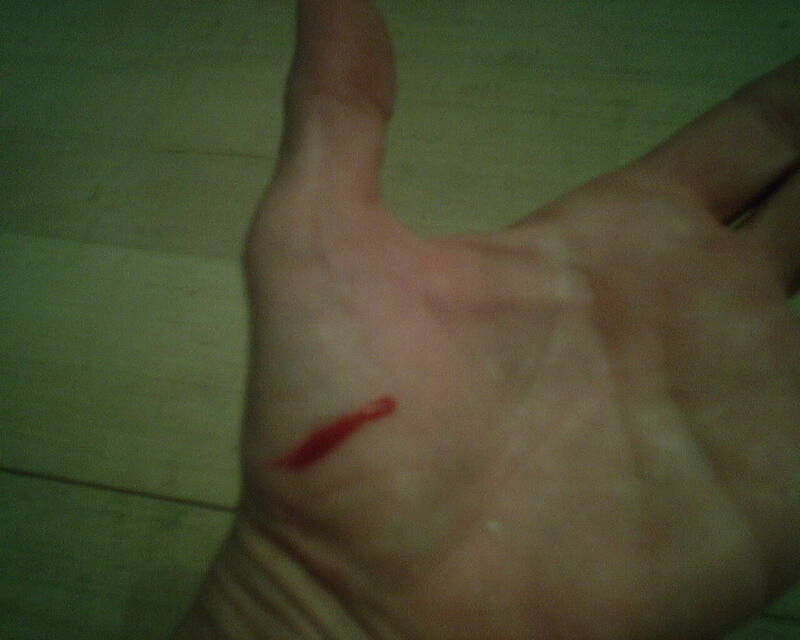 Sometimes it might be necessary to scrape the paper off the wall, which can be done with a not-too-sharp 3″ stiff putty knife, taking care not to gouge into the wall surface. Finally – A Toilet I Can Get My Hand Behind! Ideally, the homeowner would have a plumber remove the toilet before the wallpaper goes up. But removing and then replacing plumbing fixtures can be expensive, you have to coordinate the plumber with the paperhanger, and you have to live with a non-functioning toilet for a period of time. So most people just leave the toilet where it is. 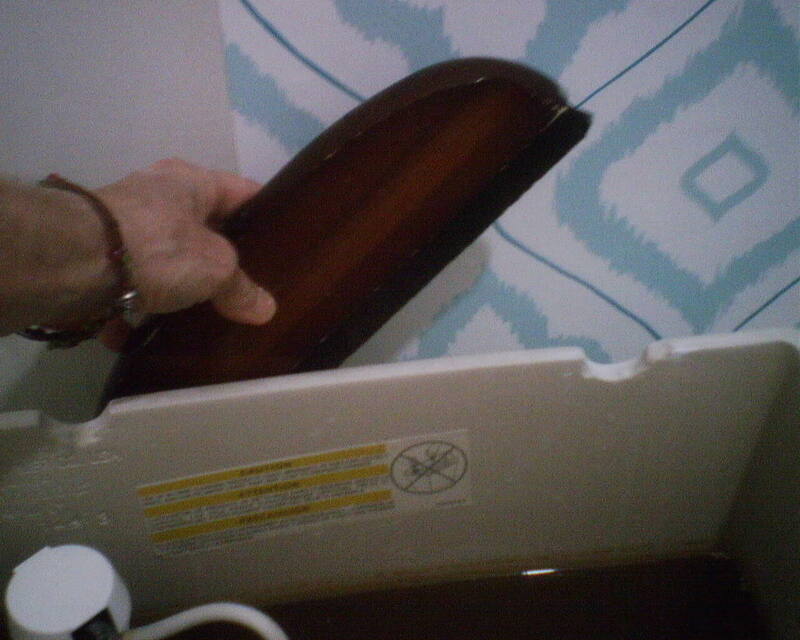 Hanging wallpaper around toilets can be tough. Sometimes there’s barely enough room to slide the paper behind the tank, and then I’ll have to use a tool or yardstick to try to smooth the paper against the wall. And there are some toilets that are so close to the wall that it is impossible to get the paper behind, so it will have to be cut around and then tucked behind the tank. Today I got lucky, because this toilet was far enough away from the wall that I could get my hand, arm, and smoothing brush behind the tank. 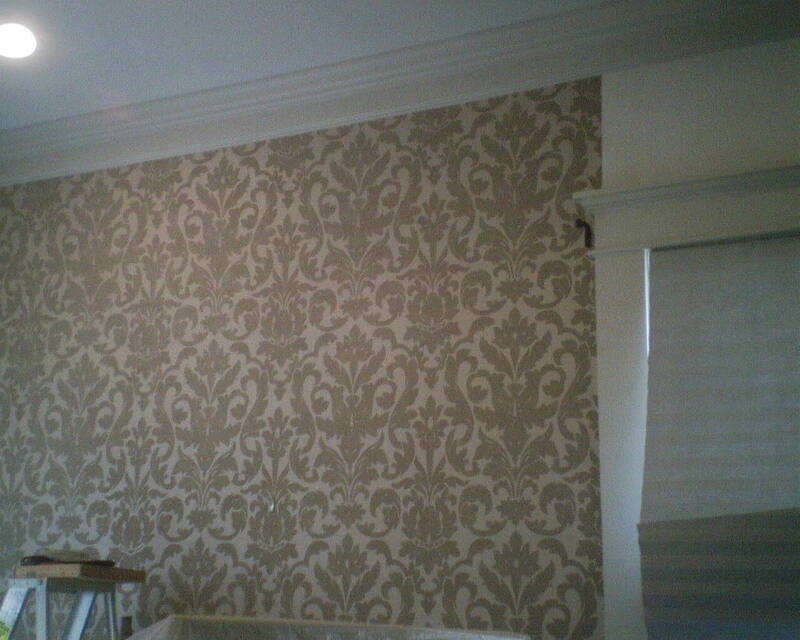 That means that I can get the wallpaper stuck nice and tight to the wall behind. 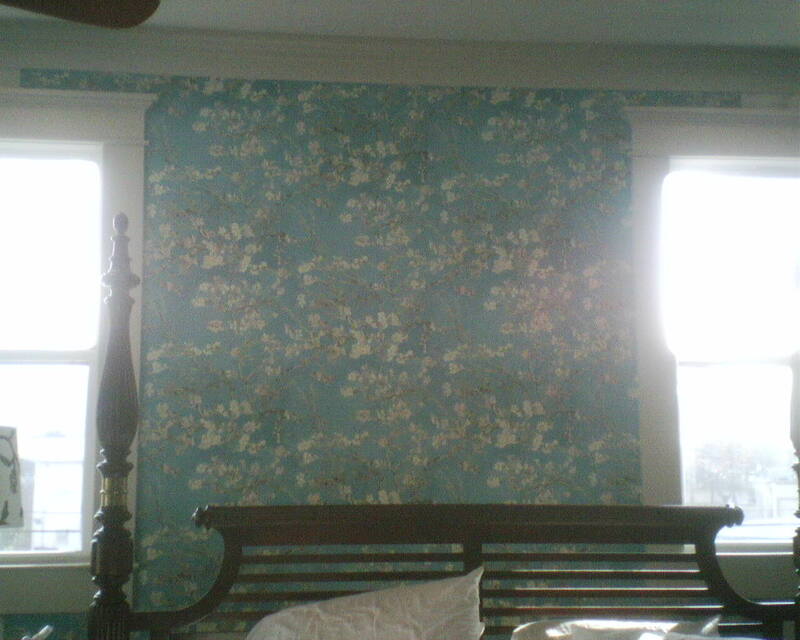 This wallpaper pattern is called “Bungalow” and is by Thibaut Designs. 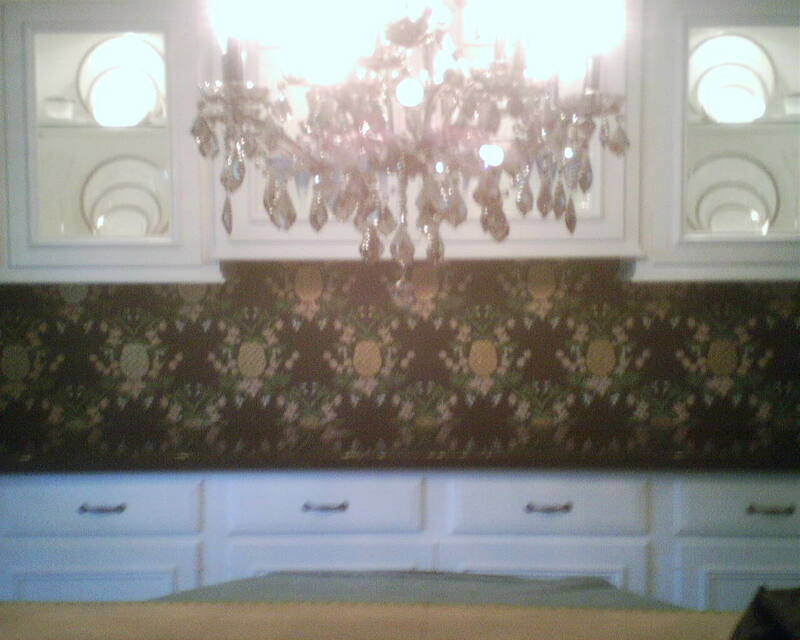 This brown & black, textured vinyl wallpaper went in the guest bath of a single guy in a newish home in Pearland (Houston). 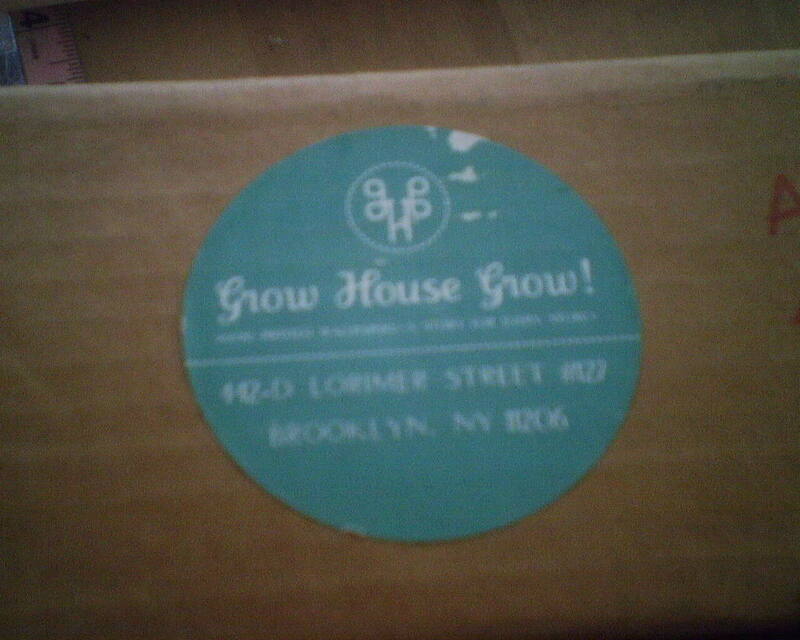 It was way too dark (and my camera way too cheapie) to get good photos of it, but in the picture by the light switch you can get an idea of the vertical texture – almost like corduroy. With a light colored shower and light tile floor and a dark brown vanity base with a light top, the overall look was stunning. The paper was thick and the edges were irregular due to the random texture, plus some of the edges of the rolls had been banged up during shipping, all of which meant that some white backing wanted to show at the seams. So I used artist’s chalk pastels to color the edges before pasting the strips of paper, and this helped a lot to hide the seams. 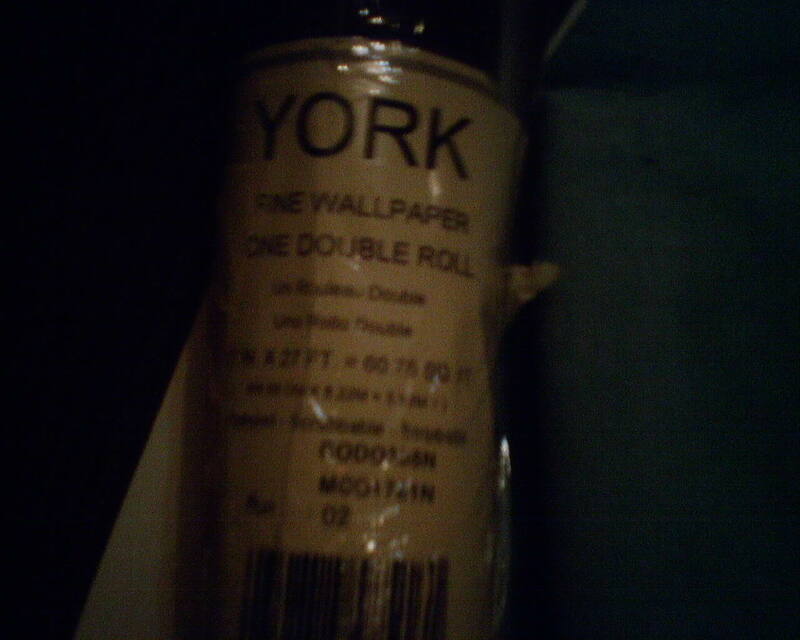 This product is by York. 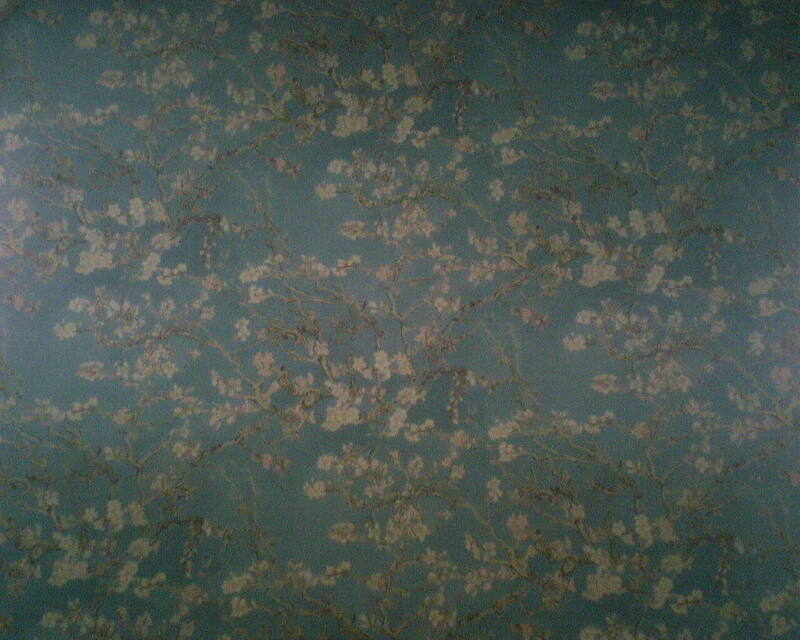 I have to admit – at first, I didn’t like this wallpaper pattern. I thought the overall pattern of the pineapples and foliage formed too regimented of a trellis design, and the pattern would look austere and severe once it played out across the walls. 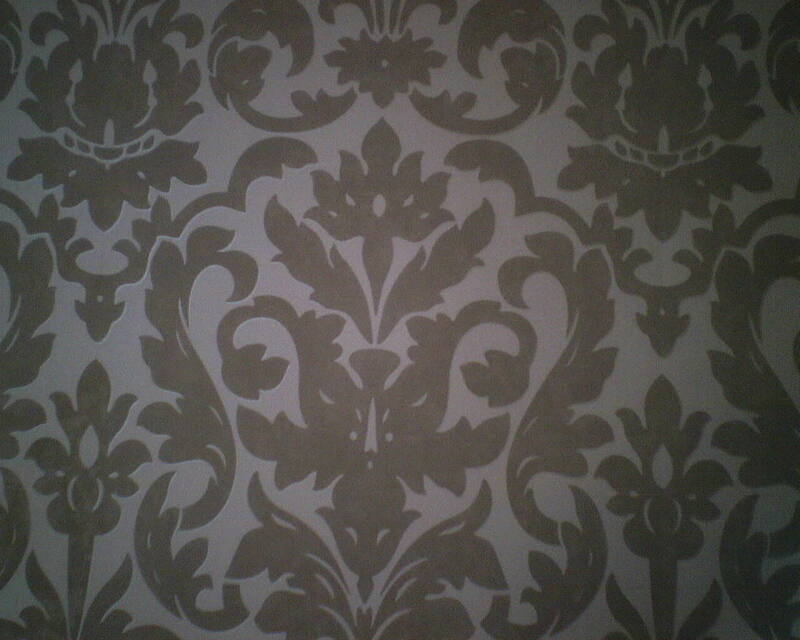 But once on the walls, the pattern is perfect! 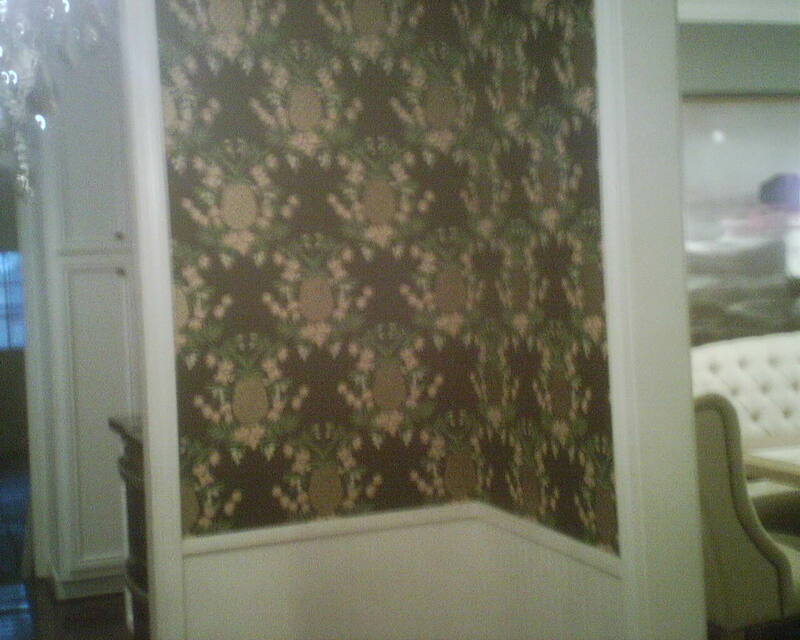 I think that if the walls were floor-to-ceiling, yes, then the pattern would be too strong. But with the chair rail and wainscoting, the scale fills the upper portion of the walls nicely, and the bold black and green and gold are a good juxtaposition with the white paneling below. Because the display cabinets on the built-in buffet are the center of attention in the room, I chose to center the pineapple pattern there. 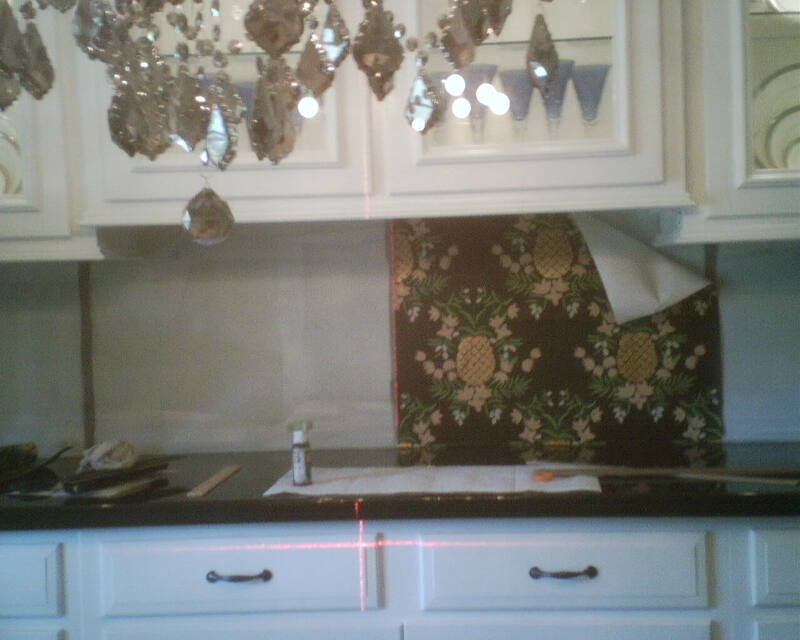 In the third photo, you see me using the laser level to get the first strip perfectly centered and plumb. 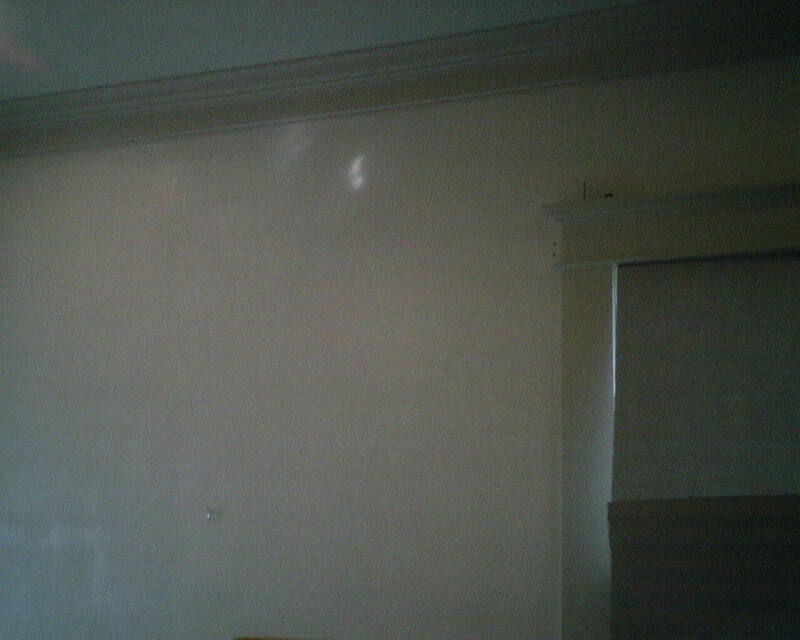 This room has a lot of decorative moldings, some of which you can see in the “before” photo, which take a lot of time to trim around. In addition, I wanted the pineapples to fall at a certain point below the crown molding and to hang at a certain point above the chair rail, and because I started on the wall with the granite countertop, which sat 4 1/2 inches higher than the chair rail, it took quite a bit of measuring and figuring and plotting to get the pattern where I wanted it … Let’s just say that that first buffet wall, plus two strips on either side, took me a full four hours. I hung this in a dining room in Spring Branch (Houston). 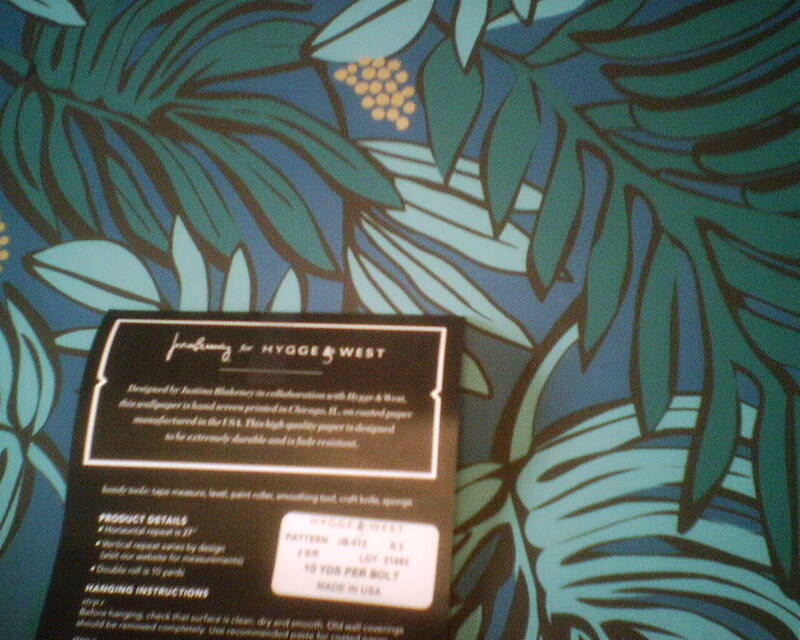 This wallpaper is by Hygge & West, an on-line company. The mothball-smelling inks used can cause the edges to curl, so I did fight with that to an extent during the day. Lightly sponging the surface before pasting, and striping the wall behind seams with a little paste both helped to keep the seams flat and tight to the wall. 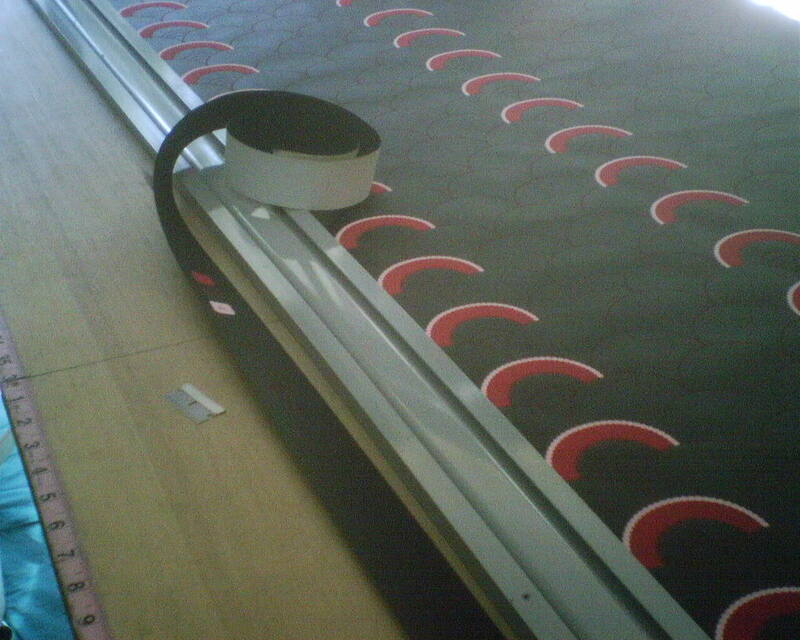 Many of the higher-end wallpapers come with an unprinted selvedge edge, which has to be trimmed off, so that the seams can be butted together on the wall. 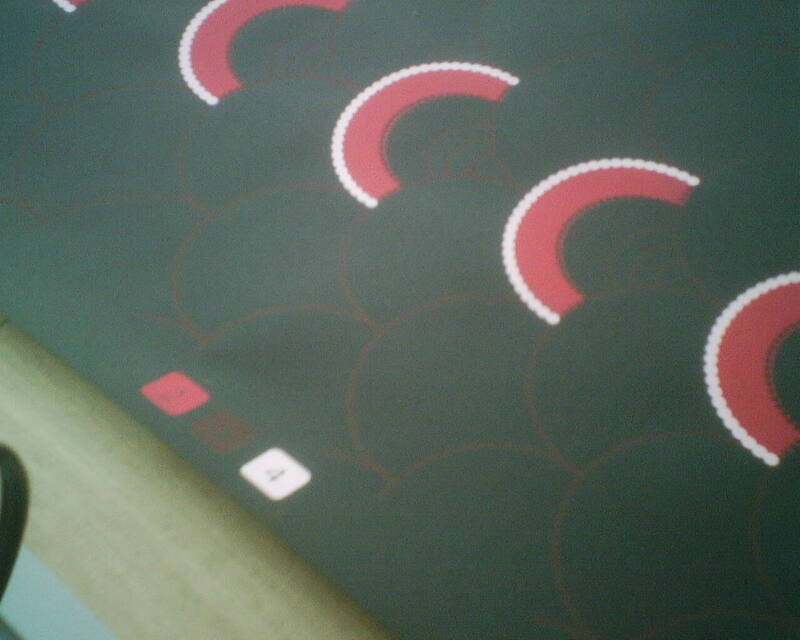 The first photo shows this selvedge, along with the proofs for ink colors that are used in the design. 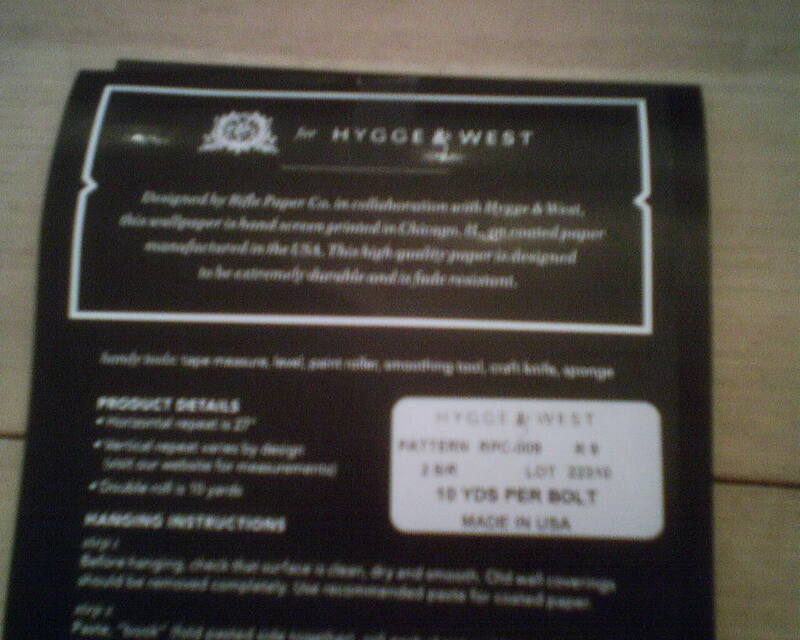 The second photo shows my straightedge, razor blade, and some of the selvedge that has been trimmed off. The trimming process is exacting, tedious, time consuming, and not always as accurate as I want it to be. 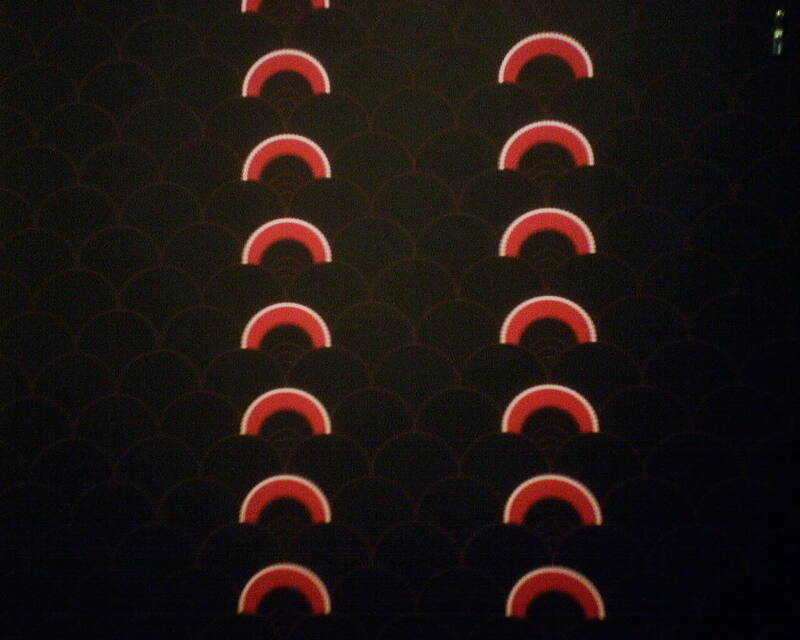 The third and fourth photos have poor lighting, but look closely and you will see the deep red dotted lines forming much of the pattern. 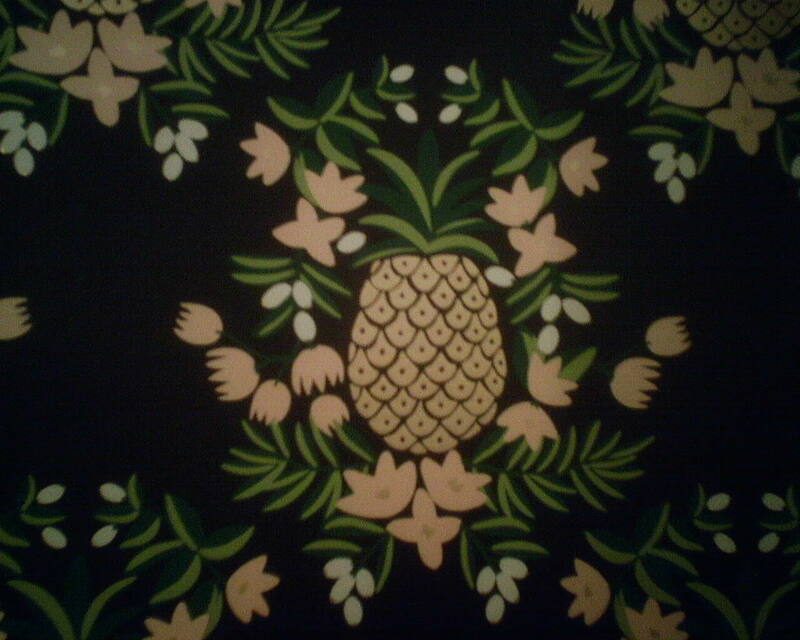 This wallpaper was bought on-line from Grow House Grow, and I hung it in a rear entry in a Mid-Century Modern home in the Highland Village neighborhood of Houston. You are currently browsing the Wallpaperlady's Blog blog archives for December, 2016.